Times and signals-they are a-changing! These days options for enjoying video are expanding. Open up your possibilities with the HD Video Converter Box from NeeGo. This mini adapter converts full 1080p HDMI signals to standard analog CVBS (standard-definition 480i, 576i) by adjusting the resolution of the digital signals while supporting DVI system sideline signals. Now you can watch video with the corresponding FL/FR stereo audio signals from a laptop or computer on your older-model electronics. The HDMI2AV signal converter's compact design means you can easily move it from room to room or take it to a friend's. It's eco-friendly, too. You can continue using your old TV and game consoles, so they don't end up in the landfill. 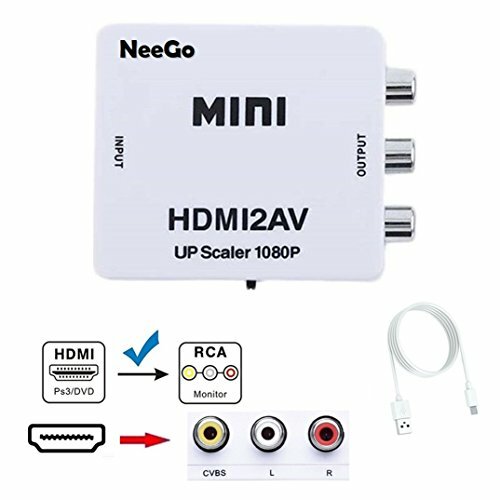 Don't settle for watching video on a small computer screen, get the bigger picture and place the HD Video Converter Box from NeeGo in your cart today! USB cable length: 1 ft. If you have any questions about this product by NeeGo, contact us by completing and submitting the form below. If you are looking for a specif part number, please include it with your message.